Powerful functions: Integrate 5 functions of digital pressure display, remaining gas consumption time display, fall call device, temperature display and alarm, and HUD data wireless transmission in one. Humanized design with simplified operation: To reduce complicated operations on site, the product is designed the function of intelligent perception of pressure, i.e. open the gas cylinder, the product starts working automatically without pressing any key, meanwhile, the equipped HUD unit starts working within 10 seconds. Small power consumption and long standby time: Use 2 AAA batteries for standby of 1.5-2 years and continuous work over 70 hours (when connecting HUD). 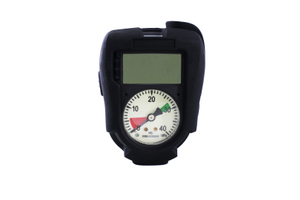 Compact size and convenient installation: Just remove the original pressure gauge of the respirator and install the intelligent digital electronic pressure gauge; The volume is equivalent to the original mechanical pressure gauge, using comfortably and conveniently.